Free Business to Business Delivery on orders over $75.00 to the DFW Metroplex!!! Beyond the simple inconvenience of disposing of metal and plastic 55 gallon barrels, throwing them in the dumpster may be a violation of local ordinances, and state law. Simply collecting them outside may be a violation of safety policies. 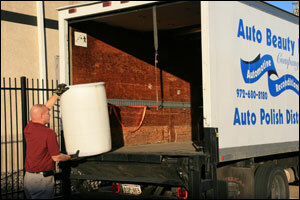 As a free service to it’s customers, Auto Beauty Products Company will pickup empty plastic and metal, 30 and 55 gallon barrels. We work with recyclers in the industry to pick up, recondition and re-supply metal and poly barrels to the chemical industry; thereby keeping re-usable drums out of landfills. For more information, to arrange regular pickup service or to schedule a one-time pickup, please contact us.